Orsi and Gazzi let numbers, and an unmatched set of graphs and tables, speak for themselves, the very best kind of reporting in an environment that tends to be over-hyped. The Classic Car Auction Yearbook also has augmented its individual car reports to include the prices realized in prior transactions, making this Marque- and date-sorted listing even more valuable. If you have a long memory, the presentation recalls the style initiated by Parker Converse for LOTS in the early 1990’s, one of the earliest attempts at comprehensive, accurate, concise reporting of collector cars at auction. A page recapping the Top Twenty from 1993-2013. Not surprisingly given recent trends, thirteen of the Top Twenty are Ferraris. Recent market strength is reflected in the transaction dates: the oldest of the Top Twenty was RM’s sale of Ferrari 330 TRI/LM s/n 0808 at Maranello in 2007. Capturing a year’s transactions in a single presentation is fraught with potential problems. The disparate circumstances of multiple auctions held in the US, France, the UK, Germany, Greece, Belgium, Monaco, Italy and Denmark by 19 different organizations, let alone the hype and promotion which the auction companies devote to their headline cars and transactions, makes an even-handed presentation difficult. The Classic Car Auction Yearbook resolves that challenge equably and informatively. It is a valuable and objective presentation that every car collector can put to good use, or simply enjoy for its presentation and information. Classic Car Auction Yearbook is large format (12.25 inches by 9.5 inches), hardbound and printed on heavy coated stock with 399 pages and many color pages. It’s available for €52 or equivalent from DEA Store in the U.S., Chaters in the UK, Motors Mania in France, Libreria dell’Automobile and others in Italy, Autonet Carbooks in the Netherlands, BM Classics in Switzerland, Mr. Shinichi Ekko in Japan and other purveyors of quality automobile books. RICK: HAPPY NEW YEAR! 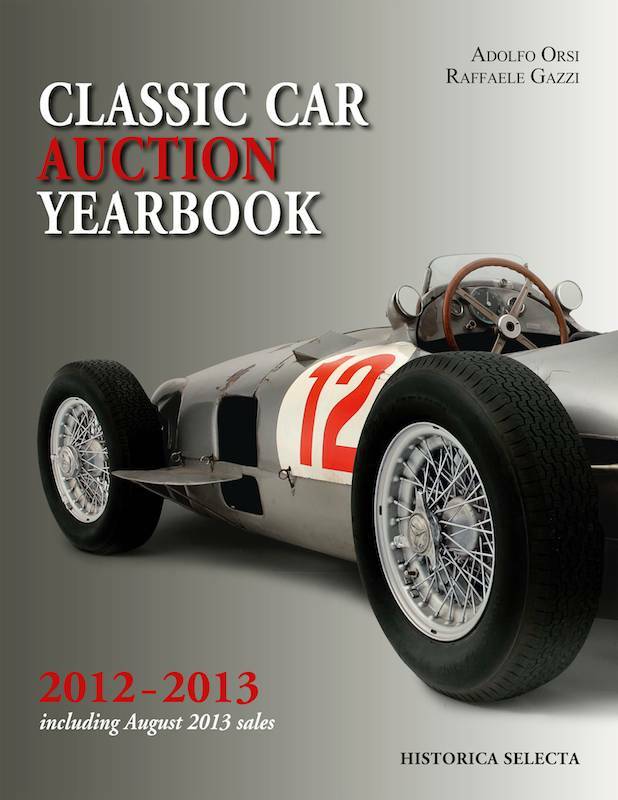 Went to the Hagerty site and found no offering of “Classic Car Auction Yearbook 2012-2013”. Guess I’ll try elsewhere. Getting a new Yearbook is one of the high points of my year. Putting it together is really a tremendous accomplishment.